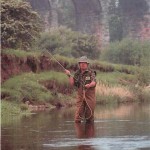 Alarmingly clear, low and slow-flowing, the Cumbrian Eden boasts a truly wild – and ultra wary – head of browns. ‘The hardest river to fly fish in all of Britain,’ says Malcolm, shaking his head as he makes his way down the dusty path towards the river on this warm day in late May. 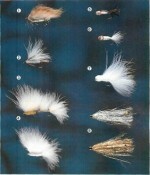 Most locals have sense enough to fish for them during the day by trotting worms or, during the long summer nights, by using Bustards, large sedge-imitating flies, or big hair wing caddis flies. Bustards have wings made of mallard, grouse or tawny owl feathers which are tied so they extend over the hookshank in wet-fly fashion. 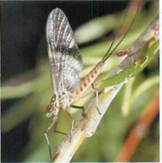 Locals wouldn’t be without them at night – for the big flies need to scratch the water’s surface, creating a wake and making a disturbance which the trout home in on. On the far bank a few trout rise here and there. 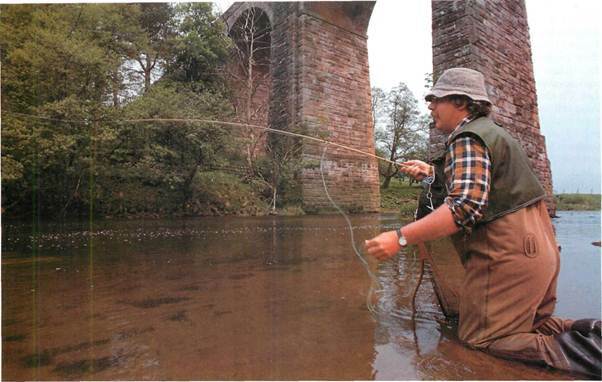 Rod in hand, Malcolm patiently watches from a distance, trying to determine if there’s a minor hatch coming off. After five minutes he still hasn’t moved. The rises continue but not at regular intervals or on one brand of insect. Opportunist feeders. Probably small fish. 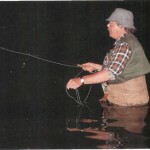 He believes the best chance of taking a good-sized brown is during the evening and at night. 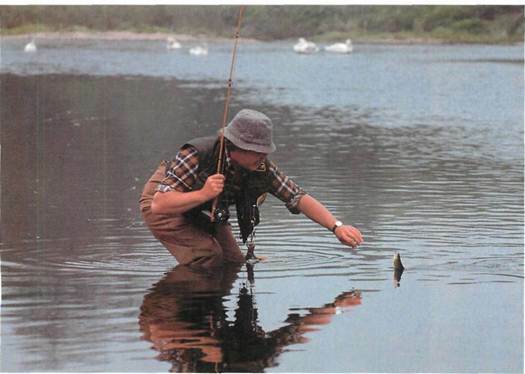 They usually don’t look at flies during the day in low-water conditions. Nevertheless, since the occasional hawthorn fly crash-lands on the glassy surface and disappears beneath the aquatic window-pane, Malcolm gives his size 12 imitation a go, but the fish aren’t fooled. He moves on to another group of trout rising farther downstream. 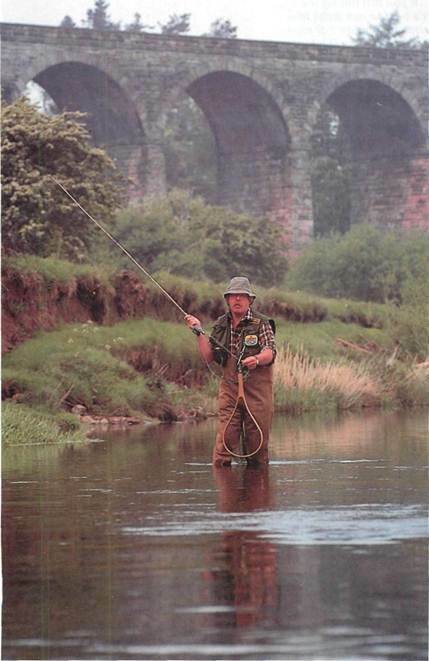 Malcolm sees a decent-sized trout surface on the far bank but, because of the varying current lanes, has problems presenting the fly well, and the trout refuses it flatly. If you don’t get it exactly right the first time, then forget it. The red lights flash: you’ve alerted the fish, and it stops feeding. At mid-day not much else is happening, so Malcolm decides to break for (a long) lunch. Downstream of the viaduct in a steady flow of fast water, Malcolm wades in and attaches an Elk Hair Caddis (size 12). The light has nearly gone. 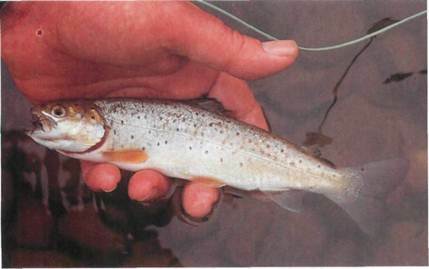 The bigger trout come out of their day-time lies and feed heavily on hatching sedges. They seem to lose a lot of their wariness under the cover of darkness. Malcolm casts upstream and occasionally gives the big hair wing fly a slight twitch as it drifts, keeping tension on the fly line because takes have to be felt -you can’t see the line. 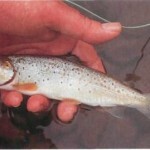 He gets a few pulls – they are from small trout, unable to stuff the big fly into their mouths. The evening has come. Malcolm moves downstream of the fast water in the heart of the glide. 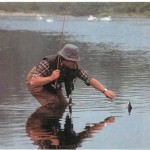 He works upstream and again twitches the fly regularly as it floats downstream for maximum effectiveness. 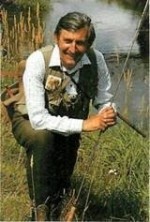 A sudden take and Malcolm’s rod bends over for just a moment and then the big nocturnal brown pops off. 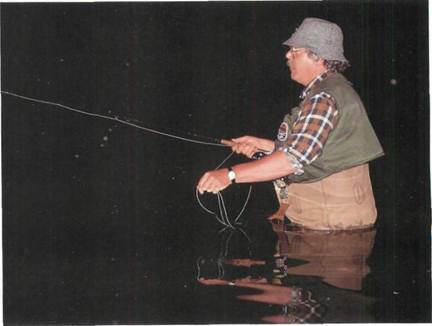 Fly casting in the darkness isn’t at all easy – and it’s very annoying when you hear the occasional loud rise farther upstream or downstream and are not able to mark it. There’s a lot of guesswork involved. 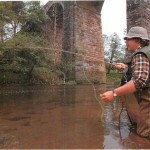 But chances are that if a trout is in the vicinity of your fly, it will take. 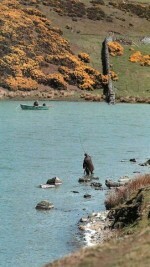 Malcolm fishes on until about I0:30pm, sadly with no more takers. What little hatch there is now stops as a cool evening wind blows downstream.